So you've heard a lot about cryptocurrencies and wanted to give it a try. Most likely, you are overwhelmed with the sea of unknowns, and your mind is blowing from endless questions: Where to start? How to proceed? What are the best practices? How to escape pitfalls and not to fall victim to fraudsters? What to keep in mind? Take a deep breath and relax. This step-by-step guide is your shortcut to the intriguing world of cryptocurrencies. Just follow the instructions and enjoy this crypto journey to the full. When it comes to digital currencies, you have a wide range of available choices. 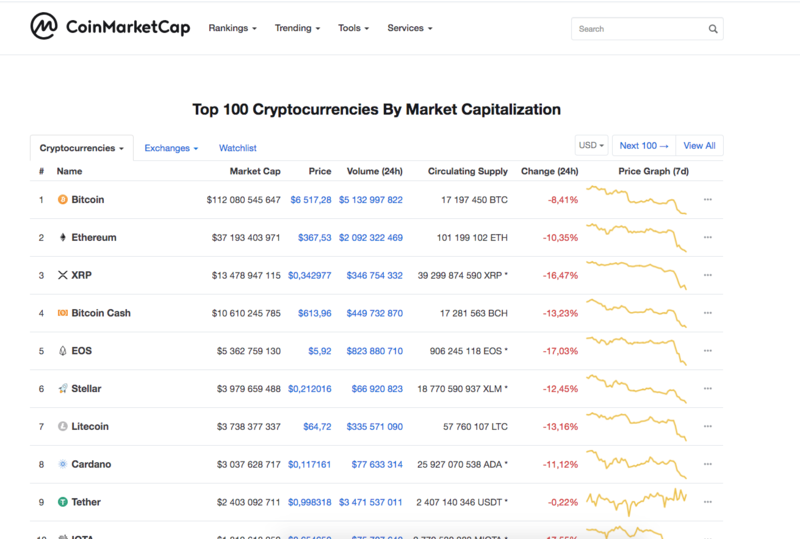 CoinMarketCap is the most popular and exhaustive listing of virtual coins and tokens and your starting point to put up a solid cryptocurrency portfolio. Currently, it contains data for over 1,600 coins and tokens with information about their exchange rates against USD, market value, and average daily trading volume. It looks like a whole lot, but don't get carried away by the numbers. A third of the listed coins are worthless, or penny stock, while another third are moving along the dead-end road. So If you are a newbie, Bitcoin (BTC) or any other well-established coin like Ethereum (ETH), Ripple (XRP) or Litecoin (LTC) might be the best and the safest choice for you. They have robust developer teams behind them, vibrant communities, a clear strategic plan and a well-defined roadmap. Once you become more confident and get the feel of the cryptocurrency market, you may proceed to altcoins, cherry picking the undervalued tokens of highly promising projects and looking for hidden gems. Just don't forget to keep your eyes open and listen to what the communities say. How Do Cryptocurrencies Affect Each Other? CryptoEconomics Redux: What’s up with Ripple? Be careful with what yo trade. While altcoins and so-called ICO tokens might be tempting due to their low valuations and purportedly high potential (most of the time promoted by their creators), the recent research conducted by the Wall Street Journal showed that 20% of all ICOs are outright scams, which means that their organizers plan to run away with your money from the start. Even if the ICO team is honest, the chances that their coin will become a success in the long-term are really slim as 46% of the last year's ventures have already failed. So, if you want to trade minor altcoins or ICO tokens, take your time to read the White Paper of the project, research the team, check it against forums and social networks and don't make big stakes on such ventures. Once you have chosen the coins you want to purchase, you need a wallet to store them. Basically, a cryptocurrency wallet is a software program, online service or a hardware device that stores your private and public keys and gives you access to your digital assets, allowing to perform transactions with them. The most vital thing to remember is that wallets do not actually store anything. They are just a tool to read the blockchain where all your records and transactions are written. Treat it like credentials to your email account - they don't contain anything, but allow you to access your correspondence that is kept somewhere else. If you lose your credentials, you lose your assets, whatever they are. Wallets are currency specific, which means that they can send and receive only compatible coins and tokens. For example, if you attempt to send Bitcoins to Ethereum wallet, the chances are that your funds will be lost forever. Read our complete guide on cryptocurrency wallets to get an in-depth understanding of types of wallets, how they work and which one is best to suit your needs. Cryptocurrency wallets can be divided into hot and cold wallets, depending on whether they are connected to the internet. How to choose a cryptocurrency wallet: Best 2018 Wallets for Bitcoin, Ethereum Ripple and Litecoin. Now that we have a wallet ready, it’s time to go and get some coins. You can buy cryptocurrency on a special exchange or directly from other people using P2P trading platforms, which are no different from traditional online marketplaces for any other product or service. 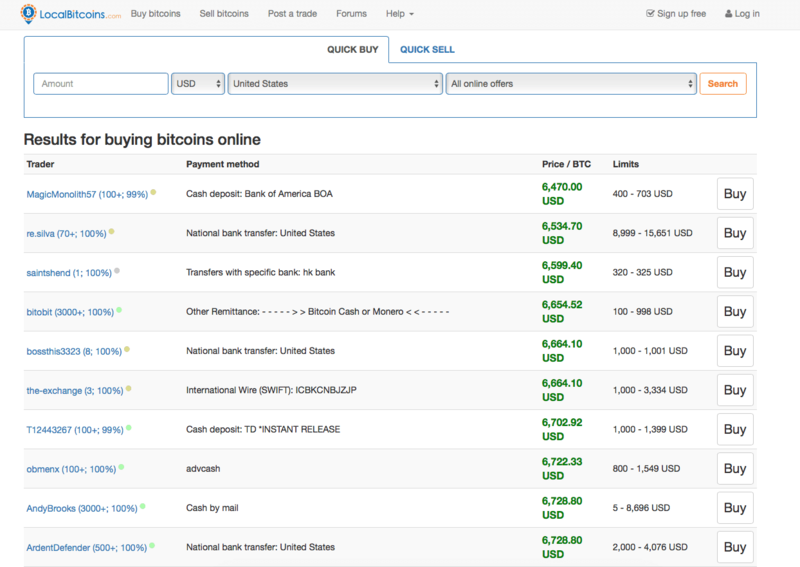 LocalBitcoins is one of the most popular resources of the kind. Basically, it's a place where buyers and sellers can find each other and settle the deal. 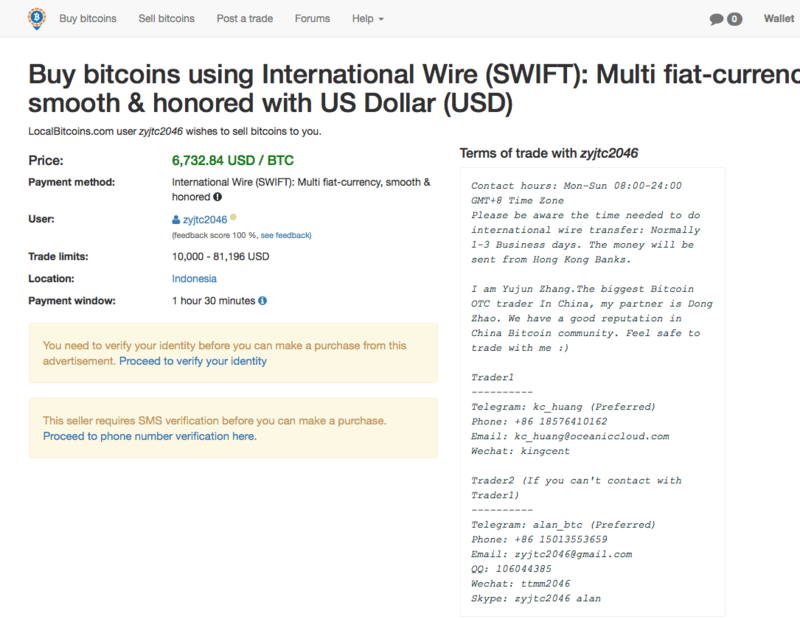 Users publish their orders to buy or sell Bitcoins for local fiat currency, specifying the preferred exchange rate, payment method and the exchanged amount. That's how the starting page of LocalBitcoins look like. You can choose the location of your prospective counter-party from a drop-down menu and filter the orders by the offered amount and accepted fiat. You'll need to register with the service to proceed with the deal; however, the registration process is simple and won't take you more than a couple of minutes. You'll be asked to provide a standard set of data: username, email, and password. Don't forget to verify your email by clicking the link in the confirmation letter. Also, the service will ask you to provide your real name and verify your identity before you go and look for the best offers from the sellers in your neighborhood. P2P platforms are the fastest and easiest way to buy some coins, though comfort comes at a price: the exchange rate at such places is usually higher and sometimes additional fees apply. The trading platforms often get hacked and stop working, while their owners disappear together with their clients' money. In other words, P2P crypto platforms are flexible and user-friendly, but you need to be on fraud alert. Another way to get some crypto is to register with a cryptocurrency exchange or brokers such as Coinbase, Bitstamp, Kraken, and YoBit. Currently, there are dozens of exchanges where you may buy and sell digital assets for fiat, though not all of them equal in terms of the range of available instruments, reliability, liquidity, and security. Strictly speaking, a cryptocurrency exchange is a middleman that creates and supports a convenient infrastructure for buying and selling digital assets. They offer better exchange rates but take hefty transaction fees. While choosing an exchange, don't forget to take into account such parameters as spread, purchase and withdrawal limits, trading volume, technical support, insurance, and user-friendliness of the interface. Also check the track record of the exchange to see if it was hacked, or tilted on the verge of bankruptcy. Hopefully, you have already bought your first digital coins and familiarized yourself with the crypto world to the point where you may want to trade to make money. Let's start with choosing the right exchange and exchange services. There are many exchanges with a wide range of cryptocurrency pairs and trading services. You won't be able to deposit or withdraw fiat on most of them, so your bitcoins will come in handy. They will buy you altcoins and tokens, allowing to diversify your trading portfolio and take advantage of opportunities offered by less popular coins. While smaller exchanges might tempt you with favorable trading conditions, large and established companies offer better liquidity, which means that you'll be able to buy and sell any amount of coins with minimal costs. Cryptocurrency exchange trading obeys the general laws of speculative trading: to make a profit you have to buy when the price is low and sell when it is high. It means that the primary instruments and critical trading objectives applicable to forex, stocks, and commodities can be easily used for cryptocurrency trading. If you know the fundamental principles of trading on any financial market, you'll be at home with cryptos. Another way to trade cryptocurrencies is with a broker. Contrary to crypto-exchanges which come from the new world of digital coins, brokers come from the world of trading, many of them from foreign exchange, or forex. Brokers make onboarding and trading much easier and more sophisticated, but they may be limited in the number of coins and in fork opportunities. Brokers are usually better regulated, allow leverage, and advanced technical analysis. The charting tools and the vast experience these companies have life easier for savvy traders and also for beginners who want to focus on trading. Going short, or betting against the price, is a common practice in forex trading and it is made easy by trading cryptos with forex brokers. So should you choose an exchange or a broker? The first question to ask is: do you want to own the cryptocurrency or just trade it? Trading with brokers does not require a wallet and does not involve owning the cryptocurrency. As mentioned earlier, it makes trading easier but does not allow taking advantage of fork opportunities. Sometimes you will prefer to stay with the original crypto coin and sometimes to go for the new one. This is impossible when you do not own it. The cost structure is quite different between crypto-exchanges that charge fees and brokers that have spreads. Comparing costs can be complicated but definitely worth your time. The answer depends on your needs more than anything else. Refer to these guidelines to learn more about the trading on the financial markets. Cryptocurrencies and blockchain technologies are often touted for their anonymity and privacy features, but those privileges come at a price. If your cryptocurrency exchange is hacked, you are likely to lose all your assets, and there will be no one held responsible or to compensate your losses. Basically, it means that you are in charge of your finances to the full extent, so make sure that you have taken all available protection measures to reduce the chances of being robbed by some smart hacker. According to the latest statistics of Group-IB, the number of compromised accounts on cryptocurrency exchanges increased by 369% in 2017 as compared to 2016. Yhe overwhelming majority of affected users ignored two-step authentication or set a weak password with less than eight characters. Such a laisse fair attitude made them an easy game for the criminals. Unlike any other financial market, cryptocurrencies are traded 24/7 and have no breaks for weekends or public holidays. The market is most active during Asian hours as this region is responsible for the lion's share of daily trading volumes. It means that the Asian session may be more volatile and unpredictable as compared to European and American hours. Cryptocurrency exchanges offer simple registration procedure, though most of them require ID verification under AML or KYС. The confirmation may take a while, so it is better to initiate the process in advance. Cryptocurrency exchanges have notoriously bad technical support service that keeps customers waiting for weeks and even months; moreover, you risk losing your money if the platform is hacked or experiences a technical issue, which means that you have to pay particular attention to security features and always be on the alert. Cryptocurrency trading fees are higher that forex ones, but they are compensated by cosmic market volatility that may bring you thousands of dollars in a matter of hours. Some exchanges offer marginal trading with standard leverage of 1:5. However, don't get carried away by the benefits of marginal trading. Given the volatility mentioned above, the risks of losing everything are even more significant. There are a few things to consider before you start trading cryptocurrencies that will help to avoid problems, staying sane, and protecting your capital. Security is your top priority.A cryptocurrency exchange is not a regulated entity. It means that they do not have an oversight authority that controls their actions and protect traders from bad actors, manipulations, and malpractices. A cryptocurrency trader has to be extra vigilant while choosing a cryptocurrency trading platform. Don't risk the money you cannot afford to lose. This rule applies to any speculative trading, and cryptocurrency trading is not an exception here. This market is characterized by extreme volatility, which means that trashed hopes and total failure can replace a moment of financial glory, whether you are trading Bitcoin or an obscure Altcoin. Money-management is a must. Make a trading plan and stick to it no matter what. A solid trading strategy and self-discipline will hold you from rash decisions and eventually help to preserve your capital. Consider diversification and don't put all your eggs in one basket. This advice applies both to your investment portfolio and a range of trading platforms your work with. Considering mounting cyber threats and risks of exit scams, it is unwise to entrust all your coins with one exchange or putting all your money in a single coin. Diversification will provide you with an additional protection layer and open up new investment opportunities. If you follow these four golden rules not only will you avoid losing all your capital even if the market goes against you, but you may also earn a handsome profit. 1. They have no trading strategy. These traders open random trades following their intuition or recommendations from another crypto guru. They end up with spontaneous buying and selling, having no idea what their doing. 2. They cannot accept losses. These traders do not understand that losing money is an integral part of the process. You just have to get the perspective, learn from your mistakes and move on. 3. They put everything at stake. Don't invest the money you cannot afford to lose - this is the golden rule for all types of investments, and cryptocurrencies in no exception here. 4. They believe any kind of rumor. The Crypto universe is full of misleading and contradictory information. FOMO and FUD are part and parcel of this market, which means that you cannot believe everything you hear. 5. They have heightened expectations. Some traders believe that they will get a steady income trading cryptocurrencies, but they may be bitterly disappointed as steady is not applicable to crypto market, which is very volatile by nature. Trading cryptocurrencies does not have to be a tiresome and obscure process once you know what to do and what to expect. Below is a quick round up of key takeaways. How to buy and trade cryptocurrency in five easy steps.